This year we hosted two good friends of SDX once more during our 2017 season. After a successful 2016 collaboration, Greg Skomal and the Atlantic White Shark Conservancy returned for another two trips back to back. Joining us once again was Ralph Collier of the Shark Research Committee for his third expedition late into the season. Both charters where treated to some of the best shark action of the year! For Greg Skomal this is the second year returning with us and the forth trip in total as he ran two trips back to back each year. Last year the two trips where both full of sharks – “Scarboard” and “Lucy” stealing the show on the first and “Bryn Penney” on the second. This is now Ralph Colliers’ third trip out with us and in the past he has also met some of the islands finest – in 2015 the enormous “Tail Scratch” and last year (like Greg) he had some fantastic interactions with “Bryn Penny”. The stakes where high to pull it off for both charters once more! The return of Greg and his guests saw two very different trips shark wise from the previous year. During the trips in 2016 it was really all about the big females as we had many of our classic Guadalupe mega sharks around at the time. This year we where yet to see one of the islands big girls however, the shark numbers where still very high and two particular animals put on a amazing display. “The Legend” and “Screaming Mimi” have really made a name for themselves this year and they where the two sharks that gave Gregs’ guests many unforgettable dives. “The Legend” (who was so easy to identify due to being covered in accompanying Pilot fish) spent many hours circling the cages very close and giving each guest perfect viewing and photographic opportunities. Ralph likes to come as late as possible into the season for the higher chance of seeing one of the islands’ big females so this year he picked the final dates of the season. As mentioned we had not seen one of our “mega sharks” as yet this year but Ralph must have brought his luck with him as he was the first (and only) charter of the year to catch a glimpse of the first big girl to arrive! As well as meeting “The legend”, “Screaming Mimi” as well as “Monkey” it was the grand entrance during the final day that had everyone in a frenzy. Although she didn’t stay with us for long and sadly we where unable to identify her, we estimated her around least 17ft and Ralphs’ record of seeing a big female each year was set to continue! 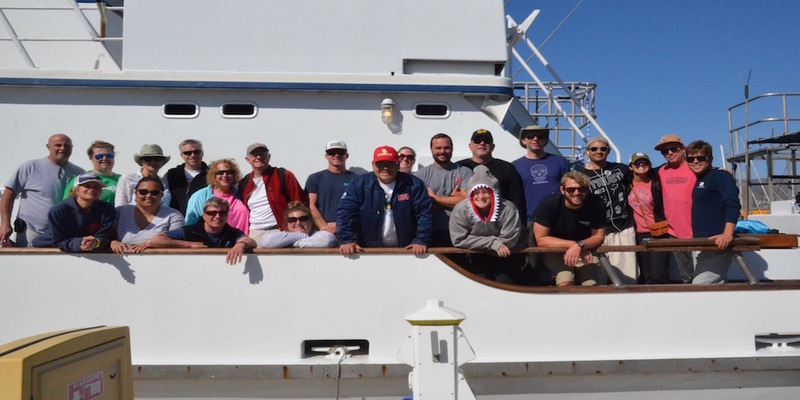 We are pleased to announce that Ralph Collier is set to return for a final voyage with the Shark Research Committee this fall and he is scheduled again, for the final trip of the year for the maximum chance to see one of the islands mega sharks! We cant wait to get back out there and do it all over again.